Dennis Bartlett Photography | A Vancouver photography blog. Usually Vancouver architecture but also about travel in Vancouver and in beautiful BC. Also, some images of my little dog, Harley, from time to time. Early January always makes me think of my mom. Her birthday is on the 4th and it comes very quickly after the new year. I know how much she loves the beach, but living in Hamilton, it’s not always easy for her to get to the beach, especially at this time of year. So, as a birthday present, I went to my favorite Vancouver beach for her. What a great son! Since I can’t figure out a way to effectively send pics of Harley to my parents, this seems like the easiest way to appease my mother’s request for more pictures. Low tide at Spanish Banks is Harley’s favourite time at his favourite place. Something about the wide open spaces and shallow water. A good friend of mine has a nice little house on Salt Spring Island. Things have been relatively hectic for me recently and he was kind enough to invite me over for a couple of short visits. I feel like I’ve just scratched the surface of what nature keeps hidden away on Salt Spring; culturally it’s a world away from the hustle of Vancouver. It’s where hippies come to live, die and get high. If you get out this way, I think it’s worth a short stay. 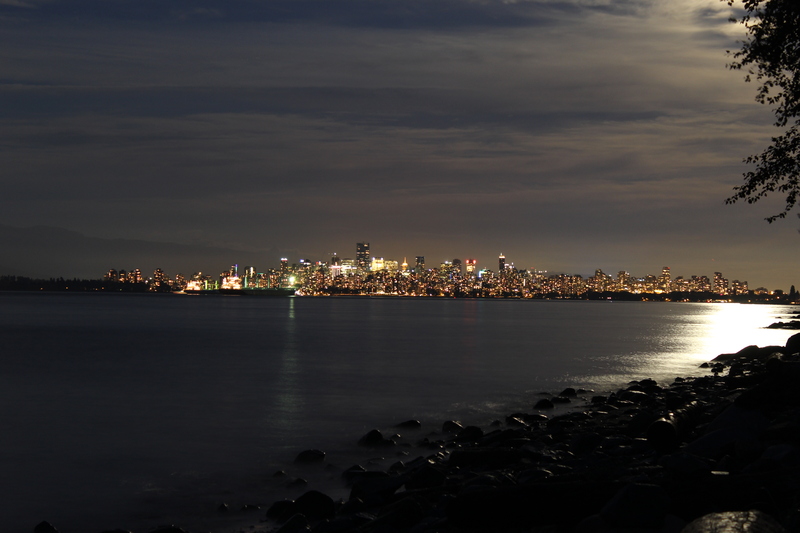 I’ve been trying a while to get a good night-time shot of the city from Spanish Banks. Without getting all messy-messy with editing software. This one is bare naked, as shot. No tricks. No gimmicks. No cropping. No adjusting contrast or tinting. No nothin’. Just like all my other ones. Nudge, nudge. Wink, wink. God, I’m so lucky to live here. By here, I mean Vancouver, BC. One of the great things about living here is that getting there is so easy. And by there I mean Whistler, The Okanagan, Northern Washington State – or in the case of this past weekend, Vancouver Island. I wanted to get away and it’s been a while since I was on the Island, so I promised myself a trip with no real agenda or plan. In fact, I was going to Victoria, in the south, right up to the time when I pulled into the ferry terminal. I decided to take the ferry going north instead. Along the way I encountered some noisy sea lions and quiet seals, a few small towns and a pretty little city. In Howe Sound, just off the coast near Lions Bay, there’s an island called Gambier. It’s a pretty little spot, deliberately keeping a much lower profile – and infrastructure – than its neighbour to the south, Bowen. There is just one small store and the roads, the few that are there, are gravel or dirt. No vehicle ferry service exists. Anything big is barged in. It’s the kind of place where people from Vancouver know the name, but can’t quite place it. Just the way those who live there like it, I imagine.